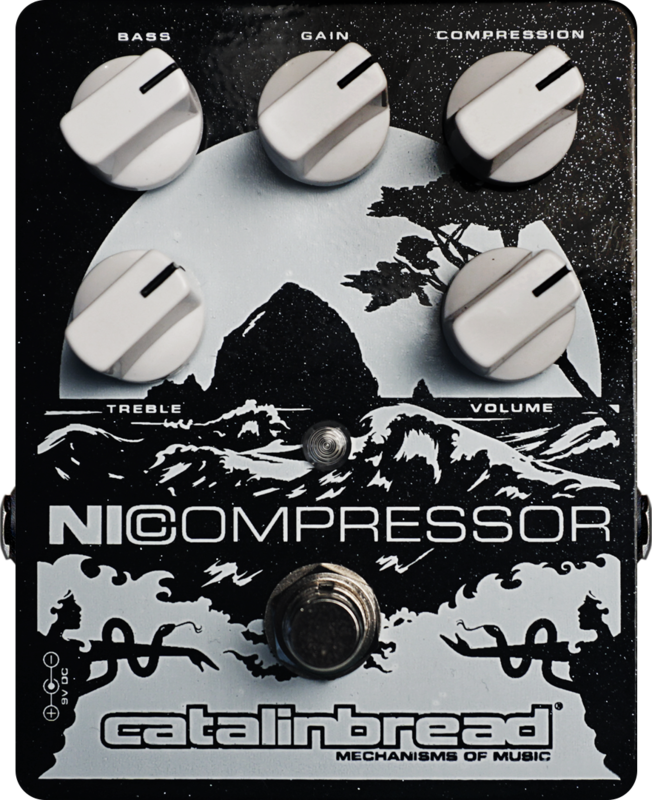 Today, Andy is checking out a special new release from Catalinbread, the new NiCompressor (pronounced nigh compressor). The pedal was made in honor of the late Catalinbread founder, Nicholas Harris, who died tragically back in 2016. The NiCompressor was the last circuit he had been designing on the breadboard when he passed away. The NiCompressor is an analog FET-based circuit based on the Loco Box Choker Compressor pedal, with a comparable tone to a dyna-comp, according to Catalinbread. It has a single "set-it-and-forget-it" Compression knob that can be dialed in from subtle to squashed. But it also features a few controls you might not be used to seeing on a traditional compressor. These additional features include an EQ with bass and treble cut/boost and a gain, which is particularly cool because it doesn't affect the compression. "You can really crank it up," Andy says, "And it's not going to change the threshold or the attack of the compression, just add more gain and really help it push your amp into overdrive." With a chassis illustration of Haystack Rock, the spot on Oregon's coast where Harris was visiting when he died, and the careful fine-tuning of the circuit he left behind, the NiCompressor is a fitting tribute to a builder that had such an impact on the pedal community. Be sure to check out Andy's full demo in the video above to hear what the NiCompressor is capable of. And click here to pre-order your own on Reverb.